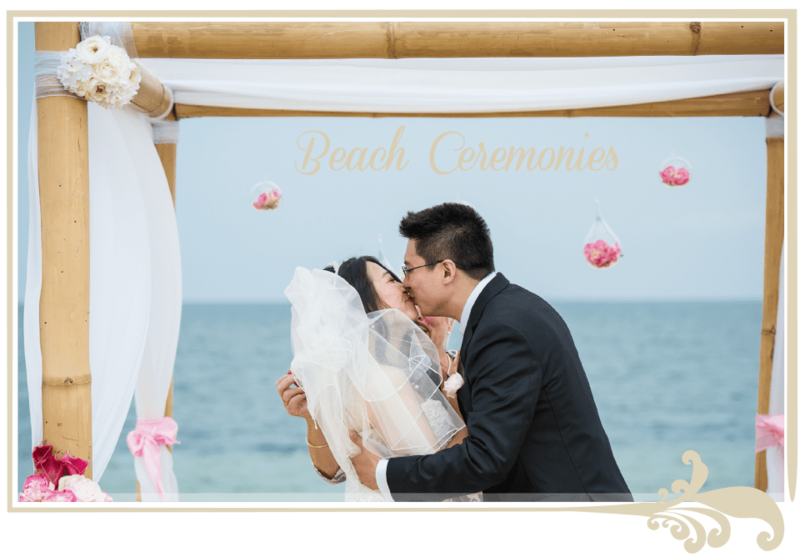 Beach Wedding Ceremonies can provide a relaxed and fresh setting. Planning a beach wedding? Looking for the perfect beach wedding styling? We have all the latest beach wedding ideas and beach wedding photo galleries to capture your attention. Vintage Rustic: Vintage canopy with burlap & vintage lace, brown suitcases, rustic chairs and vintage flowers. Add a vintage crystal chandelier. Beach Glamour: Sheer glamour and elegance: hanging crystal stands, Orchid Floral Header or a gorgeous white draped arch. Finish off with white aisle runner. Modern Luxe: Black and White theme, a white draped bamboo archway, and modern black and white decorations on the signing table. Beach Bohemian: A gorgeous Beach Wedding in the sand, using a 4 poster bamboo canopy, draped with sheer white fabric, and gorgeous orchids. View our beach wedding ceremonies gallery for more beach wedding inspiration. Contact us for a Beach Wedding Ceremony styling quote. We can style a wedding to suit your theme.